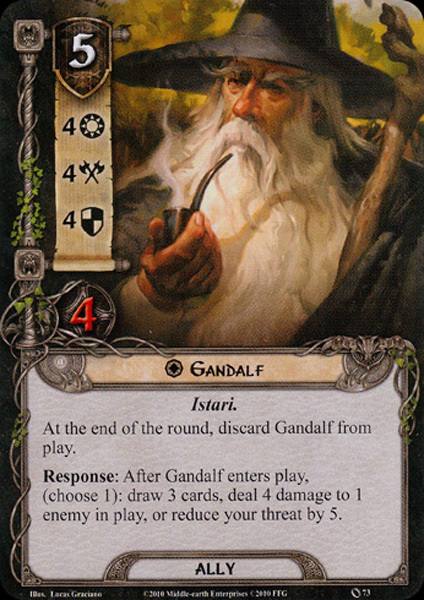 The wisest of the Maiar, Gandalf was created by Ilúvatar before the Music of the Ainur. At the beginning of Time, he was amongst the Ainur who entered into Eä. Here he became one of the Maiar of Manwë, Varda, Irmo and Nienna named Olórin. By Nienna he learned pity and patience. Olórin , like the other Wizards, took the shape of an old man. He was robed in grey and went about as a wanderer and counselor. Gandalf escaped Dol Guldur and returned to the White Council. After relating his discoveries, he urged the council to attack Sauron while the One Ring was still lost and Sauron's power immature. But Saruman said that it was better to watch and wait; that the One Ring had long ago rolled from Anduin to the Sea. The majority of the council agreed with Saruman. Elrond Half-elven, a powerful member of the council, later privately told Gandalf he had a foreboding that the Ring would be found, and that the war to end the age was coming. Indeed, he added, he feared that it would end in darkness and despair. Gandalf encouraged him, saying there were many 'strange chances,' and that, 'help oft shall come from the hands of the weak'. Gandalf did not yet realize that Saruman now wanted the ring for himself and was secretly searching for it along the banks of river Anduin. Ultimately, Gandalf concocted a plan wherein Thorin could destroy Smaug and recover his family fortune, albeit with a 'burglar' of Gandalf's own choosing. Gandalf had a feeling that a Hobbit should be involved, and he remembered Bilbo Baggins. At first he found only Holman Cotton as Bilbo had left on the occasion of the Elven new year, something that persuaded Gandalf that Bilbo was the right person for the job. He visited Bilbo later, bringing along the kinsmen of Thorin. In the end Gandalf convinced the reluctant Baggins to become a burglar for Thorin. Gandalf then accompanied Thorin and Company to Rivendell. 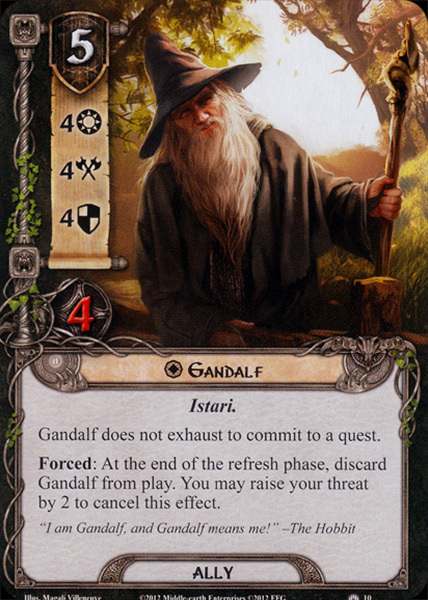 During the journey Gandalf was instrumental in saving the travelers' lives from several calamities. Gandalf saved them from a trio of Stone-trolls, and later obtained the legendary sword Glamdring from their Troll-hoard; Gandalf bore it thenceforth. He also helped Thorin and Company through the Misty Mountains; when unknowingly they camped in the Front Porch of the Goblin-town the Goblins captured the whole company except Gandalf, who surprised them much later, killing the Great Goblinand then leading the Dwarves to the exit. It was during this time that Bilbo obtained a 'magic ring'. Bilbo initially claimed he 'won' it from the creature 'Gollum' while the company was under the Misty Mountains. The ring conferred invisibility on Bilbo when he wore it, and he kept it secret from Gandalf for some time. Gandalf then sought the hospitality of Beorn, persuading him to welcome and host the whole Company in his hall. But then he left the quest prior to its completion; after leading the Company to the outskirts of the Forest Gate, he gave them some final advice (but little did he know that the lands had changed by then) before they'd enter Mirkwood, and went to attend other obligations. The White Council had met under the gravest of circumstances: Sauron's vast power was returning, even without his Ring. Gandalf at last convinced the Council to attack Dol Guldur, to which even Saruman agreed (as by now he feared Sauron as a rival, and wished to delay his search for the Ring). Gandalf joined his peers in assailing Dol Guldur, ridding Mirkwood of the Necromancer's presence, who fled to Mordor. When he was about to finish his task, news about what happened to Thorin's Company in Mirkwood reached him, and realized that the instructions he gave did not help them; they had lost their way, and then vanished from the imprisonment of the Wood-elves, who had captured them. He was anxious to get back to them as soon as possible. Despite the Council's hopes, Sauron was not weakened by this attack. He had foreseen the move that drove him from Mirkwood, and his retreat was but a feint. Ten years after the attack, Sauron declared himself openly in Mordor in 2951and rebuilt the Barad-dûr. The White Council met for one last time in 2953 to debate about the Rings of Power. Saruman quieted his peers claiming to have the knowledge that the One Ring was lost in the Belegaer. After their meeting, Saruman, jealous and afraid of Gandalf, set spies to watch all his movements; this would affect the peaceful Hobbits, as Saruman thus discovered the existence and noted Gandalf's interest in the Shire, and started sending agents in Breeand the Southfarthing. During this period Gandalf visited the Shire frequently, especially his friend Bilbo Baggins, and his younger cousin, Frodo. He noted Bilbo's unusual youthfulness, despite his advancing age; the suspicious 'magic ring' that Bilbo had acquired during his adventure began to weigh on his mind. Gandalf recalled the deceit Bilbo used in originally claiming it for his own-- Bilbo had later admitted to stealing it from Gollum. Gandalf could see that Bilbo was now very preoccupied with the ring. Such un-hobbitlike behaviour aroused his suspicions. In 3001 he organized for him the Bilbo's Farewell Party, and before leaving the Shire, he convinced Bilbo to leave the Ring for Frodo. He then emphatically warned Frodo not to use it; Gandalf had begun to suspect that the 'magic ring' was indeed a ring of power. Keen now to find out more about Gollum, he sought Aragorn's help to capture him, a quest that lasted for years all around Rhovanion and the confines of Mordor. Studying the records in Minas Tirith, he found the Scroll of Isildur and pieced together the missing history of the One Ring; on his way back to the Shire he got word from the Galadhrim that Aragorn had finally captured Gollum and he went to Mirkwood to meet him. For days he interrogated him in order to verify what he already knew, in 3017. A great fear came over him when he learned that Gollum had been to the Barad-dûr. Sauron had tortured Gollum and learned not only of the 'magic ring', but also the names 'Shire' and 'Baggins'. Gandalf now returned in haste to the Shire, certain that Frodo's ring was not simply a ring of power: it was the One Ruling Ring of Sauron. While in the Shire, he had a sense of foreboding and in the aftermath of Sauron's attack on Osgiliath he heard disturbing news about war in Gondor and a Black Shadow. He started wandering around Eriador hearing news from the refugees who had a fear they could not speak about, until he met Radagast who brought a message of Saruman that he must seek him at once; and a warning that the Ringwraiths are looking for the Shire. He went to the Prancing Pony at Bree. Believing that he would not be able to return to Frodo in time, he wrote a letter, urging him to move as soon as possible for Rivendell, and seek someone 'Strider' whose real name is Aragorn, with a riddle to identify him; Gandalf would then try to catch up with them when available. He also instructed Barliman Butterbur to send the letter to Hobbiton and to expect a Mr. Baggins that will come under the name of 'Mr. Underhill'. He left the inn, but Barliman would forget to send the letter. Soon thereafter Gandalf arrived at Isengard. At their meeting, Saruman at last revealed his desire for the One Ring. He offered to his 'old friend and helper' that they take the Ring for themselves and seize power from Sauron. Gandalf rejected this with horror, and was imprisoned by Saruman on the pinnacle of Orthanc. Gwaihir, chief of the Eagles, soon arrived and helped Gandalf escape. Gandalf knew he must return quickly to the Shire, as Frodo (and the ring) were in grave danger from both Sauron's Nazgûl and now Saruman's treacherous desire for the ring. Elrond called a council after Frodo was healed to consider the momentous decision regarding the ring. By chance, representatives of most of the free peoples happened to be in Rivendell already for various reasons. Elrond and Gandalf advised that the Ring should be destroyed in the fires of Orodruin, where it was made. Others dissented or objected, but eventually submitted to Gandalf's plan. Ultimately, Elrond appointed the Fellowship of the Ring as nine walkers, numerically set against Sauron's nine Nazgûl. The relatively small number reflected the realization by Elrond and the other council members that the quest of Mount Doom would not rely upon strength of arms, but on stealth and good fortune. Gandalf was chosen to lead the company, which included Aragorn, Boromir, Legolas the Elf, Gimli the Dwarf, and the hobbits Frodo Baggins, Samwise Gamgee, Peregrin Took, and Meriadoc Brandybuck. Several obstacles stood in the company's way. The vast Misty Mountains had to be crossed, for Gandalf was determined not to lead the company near Isengard. Gandalf decided to take a southern route to the Redhorn Pass and there to cross the Misty Mountains near Caradhras, thereby traversing the mountain range and avoiding Isengard. When this attempt failed due to a terrible storm he then decided to take the Fellowship through the ruins of Moria, where the remains of the great Dwarf city of Khazad-dûm was now a labyrinth of tunnels under the mountains. Others in the company were loathe enter the maze, as it was now the lair of orcs and something known only as 'Durin's Bane'. At the Doors of Durin on the west side of the mountains, Gandalf, after some delay, spoke the password and led the company into the dark. Having been in Moria on an earlier perilous errand, he was somewhat familiar with the underground passages. Eventually the party came to the Chamber of Mazarbul, where Gandalf read the Book of Records, which revealed the fate of Balin, the leader of an ill-fated attempt to re-colonize Moria. Soon after, the party was attacked by orcs, and forced to flee the chamber. By then Gandalf was well aware of their location, and he led the party quickly towards the eastern exit. Unfortunately Durin's Bane caught up to the group at the Bridge of Khazad-dûm. Gandalf and Legolas immediately realized what it was: a Balrog of Morgoth, a servant of the first dark lord. In a spectacular display of bravery Gandalf faced the demon and broke the bridge both stood upon, leaving the beast to fall into a seemingly bottomless chasm. But the Balrog's whip lashed out, and grasped Gandalf by the knees, causing him to fall into the pit. While falling, Gandalf shouted 'Fly, you fools' and vanished into the abyss. Yet Gandalf did not die; he and the Balrog fought long in the bowels and deep places of Arda. After restless pursuit over the course of eight days, Gandalf and the beast finally came to the summit of the Endless Stair upon the peak of Celebdil, where he fought the demon for two days and nights. The Balrog had burst into flame anew when it exited the stairs; ice, wind, and smoke swirled about them as they dueled. Gandalf used his last measure of strength to slay the Balrog, throwing him down the mountainside in ruin. Gandalf's spirit then left his body, having sacrificed himself to save the Fellowship. But Gandalf's spirit did not depart Middle-earth forever at this time. 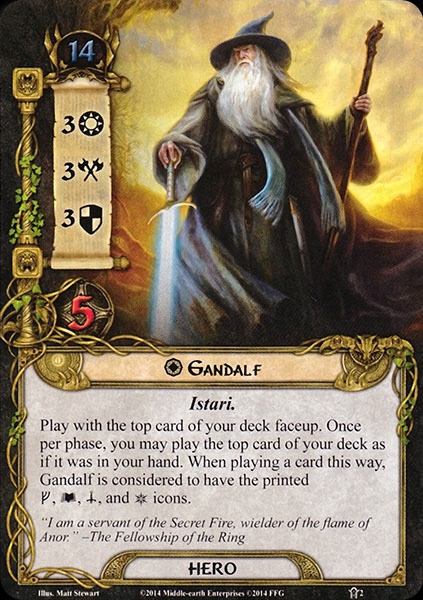 As the only one of the five Istari to stay true to his errand, Olórin/Gandalf was sent back to mortal lands by Eru, and he became Gandalf once again. Yet, as he was now the sole emissary of the Valar to Middle-earth, he was granted the power to 'reveal' more of his inner Maiar strength. This naked power that lay within him was seldom used during the remainder of his time in Middle-earth, as his mission was essentially the same: to support and succor those who opposed Sauron. Nevertheless, when Gandalf's wrath was kindled his 'unveiled' strength was such that few of Sauron's servants could withstand him. At Gandalf's encouragement King Théoden went west to Helm's Deep where he was quickly besieged; Gandalf then searched for Erkenbrand and the forces of the Westfold, which he later found and led to the Deep, thus breaking the siege. Meanwhile, the Ents (along with the hobbits Merry and Pippin) moved against Saruman and sent Huorns against the orcs, resulting in the utter ruin of the outer walls of Isengard and the complete annihilation of Saruman's orcs. After the battle, Gandalf went to Orthanc with Théoden, Aragorn, and a small group. There Saruman rejected Gandalf's offer of forgiveness with contempt. Gandalf then broke Saruman's staff and cast him from the Order and the Council. Gandalf imposed a strict watch on Isengard by the Ents and then advised King Théoden to ride to Gondor's defense as soon as possible. The wizard's mind had already turned to Gondor and the coming climactic battle in the east. Yet Sauron himself became the victim of Gandalf's trap. Unbeknownst to all, Frodo and Sam had succeeded in scaling Mount Doom and even as the Battle of Morannon began Frodo stood at the Crack of Doom. But the power and lure of the ring finally overcame his will and he placed the ring upon his finger, claiming it as his own. Immediately the Nazgûl were summoned by their lord, as he in terror realized his blunder: his enemies intended to destroy his ring. But Gandalf's foresight proved accurate again as the creature Gollum, who had been doggedly following the Ring-bearer, seized the ring from Frodo, and, while celebrating his reunion with 'his precious,' unwittingly fell into the fires of Orodruin. The ring was unmade as the fiery mountain erupted. The tower of Barad-dûr and the Towers of the Teeth began to collapse, their foundations crumbling, the Ring-wraiths burned out like shooting stars, and Sauron was reduced to a mere shadow of malice, never to torment the world again. In Minas Tirith, Gandalf and the remaining members of the Fellowship reunited. At the coronation of King Elessar, Gandalf (at Aragorn’s request) set the crown upon the King’s head, and declared “Now come the days of the King, and may they be blessed while the thrones of the Valar endure!”. Thus Gandalf ushered in the new age of men. 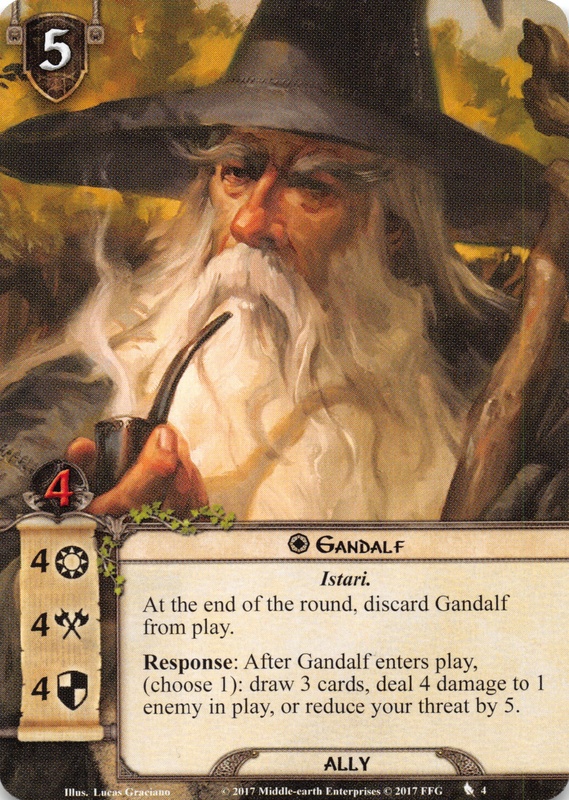 What Gandalf did during the next two years is unknown; it is possible that his 'long talk' with Bombadil was just that. At any rate, on 29 September 3021, he met Frodo at Mithlond, ready to take the White Ship over the sea to Aman. He wore Narya openly on his finger, and Shadowfax was beside him (perhaps even to take ship with him). His mission was over, and his homecoming after more than 2000 years was nigh. He bade farewell to Samwise, Merry, and Pippin (the latter two of which he had forewarned of the passage), then mounted the Grey Ship beside Frodo, Bilbo, Elrond, and Galadriel. The ship passed west upon the sea, and then took the hidden straight path to Valinor: Gandalf became Olórin once more. There, presumably, he dwells still in the gardens of Irmo. Olórin, the wisest of the Maiar and the sole Istar to remain true to his mission, had successfully kindled the hearts of the free people in Middle-earth to overcome the evil of their time. In a large way, it was his victory. Keen observers of Gandalf often detected a veiled power, usually revealed in his eyes, which appeared deep and wise. He was alternately affectionate and brusque; he often surprised others with his bluntness when time was of the essence. Gandalf consistently upbraided foolish behavior, but also richly rewarded those who acted with good intentions. Although some of the Wise know his true nature, his 'wizard-like' appearance causes many to mistake him for a simple conjurer. After his return his 'signature colour' changes from grey to white, for he has been sent back to replace the corrupt Saruman as the chief of the Wizards. In the book he claims that in some ways he now 'was Saruman', or rather Saruman as he should have been. 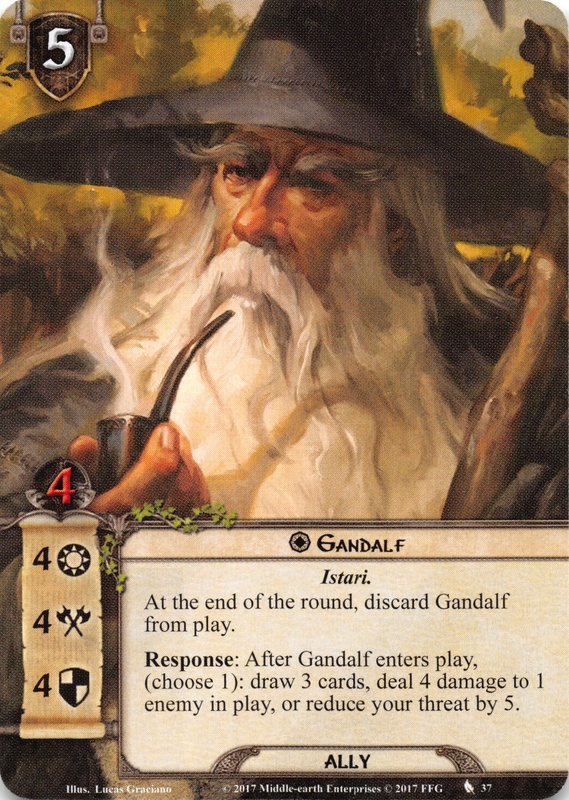 Gandalf was the bearer of Narya, the Ring of Fire, and described himself as the 'servant of the Secret Fire' and 'wielder of the flame of Anor'. 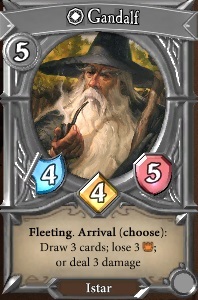 Most times Gandalf displayed his power, this had to do with fire. It is not known whether his possession of Narya had any merit to his abilities. Olórin, his original name in Valinor. It is Quenya, and its meaning is associated with the Quenya word olos or olor, meaning 'dream' or 'vision / of mind'. In a draft manuscript of The Lord of the Rings, occurs the spelling Olórion. Mithrandir, ([miˈθrandir]), his Sindarin name, used in Gondor and meaning 'Grey Pilgrim' or 'Grey Wanderer' (mith 'grey' + randir 'pilgrim, wandering man'). Incánus, his name 'in the south' (probably meaning no further south than Gondor or the Near Harad), gained during his long travels in Middle-earth in the mid-Third Age. Tharkûn, the name given to Gandalf by the Dwarves. Tharkûn is Khuzdul, meaning either 'Grey-man' or 'Staff-man'. The word possibly derives from the unattested word thark 'staff' + a nominal ending -ûn. In a draft manuscript of The Lord of the Rings, occurs the spelling Sharkûn. 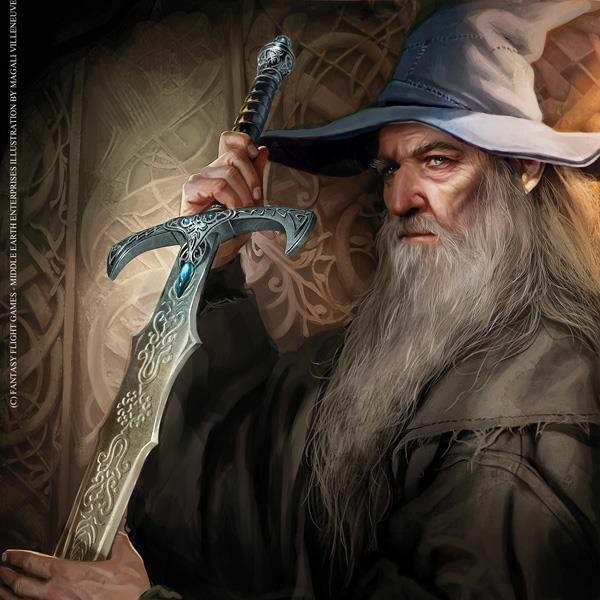 Within the legendarium, Gandalf translates an unknown name of the meaning 'Elf-of-the-wand (or cane/staff)', or more literary 'Wand-elf', in old northern Mannish. Most denizens of Middle-earth incorrectly assumed Gandalf was a Man, although he was really a Maia spirit (approximately equivalent to an angel). However, a less common misconception that occurred during the beginning of his career in Middle-earth was that for someone to be immortal and use as much magic as he did, he must have been an Elf. Although it soon became apparent to all that he could not be an Elf, as he was old and Elves do not generally age, the nickname stuck with him. He later gave it as his name to others he met who did not know its original meaning.